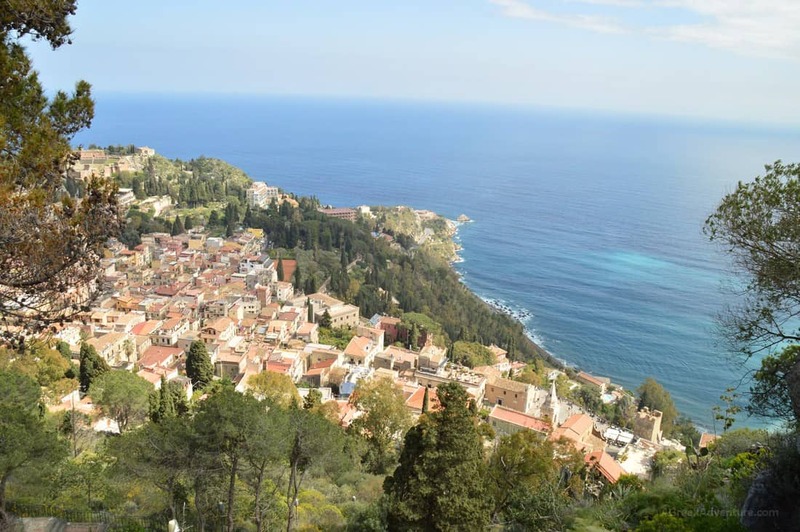 If Ortygia, Agrigento and Cefalu look picturesque to you, then Taormina will blow you away. It combines a fantastic hill city along with a great beach and fantastic architecture. The coolest thing ever? You can move up and down from the beach (way uphill), into the city, with a funicular (3 euro p.p.). Taormina is considered one of the most expensive cities in Sicily, Italy. Many celebrities prefer this place along with the Italian Riviera seaside cities. To get into the city you need to park outside of it. There are small buses that take you in. Almost all roads are stone paved. 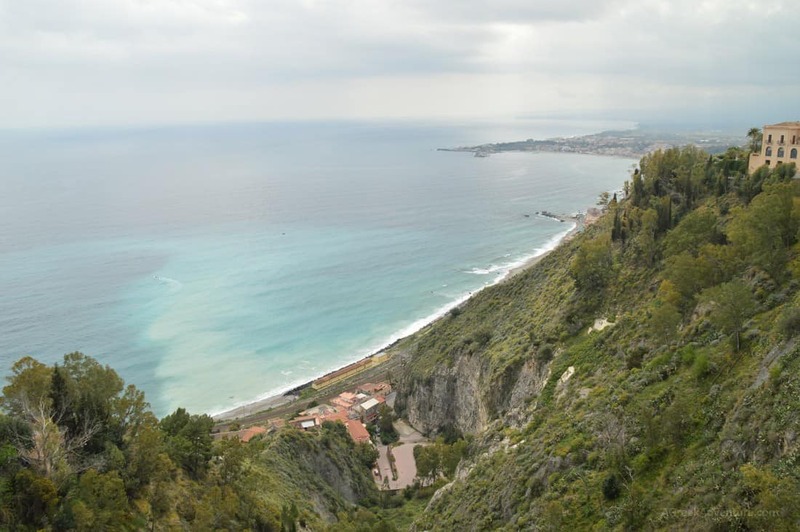 Taormina is very close (around 40 minutes by car) to Mount Etna (Aetna) volcano. You can stay in Taormina and do a half (or less than that) day trip to Etna. In fact, we first visited the outskirts of Etna and then moved to Taormina as we were driving from Catania. 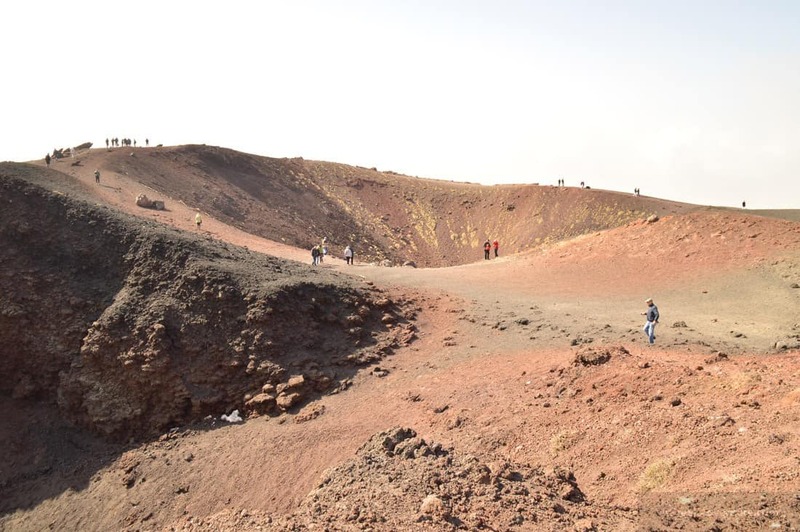 There is not just one crater, but around 400(!). This as the magma tries to come to the surface and breaks through from different points on the mountain. There are organized tours that take you there, or you can drive with your own car. The top is reachable (with guide) and is at around 3000mt. You can go to the top (if weather permits), but you need a license & a guide (around 60 euro p.p.). You don’t need a license for the lower levels. This site can be really helpful. There is a lift that takes you to the top, starting from the bus/car parking lots where tourist cafe’s exist. Don’t go for the top without prior booking your time there. Best time to be there is early in the morning, as later on clouds sum up. Temperatures vary. Even if you see lots of sun, better come with layers of clothes to be able to shift them around during your hiking. When you drive down from Mount Etna check to see where to buy the famous honey of Aetna that comes from orange flowers. This can be found at Zafferana Etnea village. 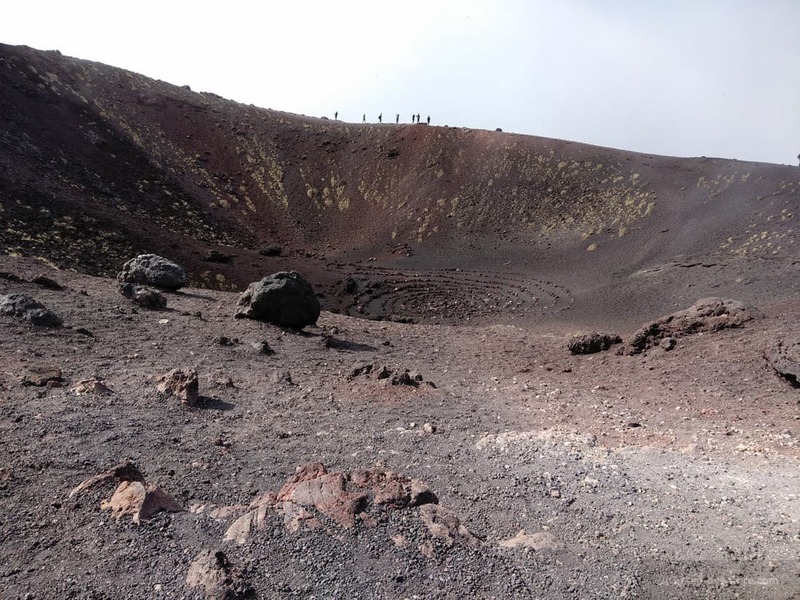 Leaving Mount Etna and in just 40 minutes (or less) you will be in Taormina. Approaching the city from the top will give you a very nice perspective of how beautiful it is and why many (celebrities too) prefer it. Some scenes from “Godfather” were filmed here. In 2017, Taormina hosted the G7 Summit. 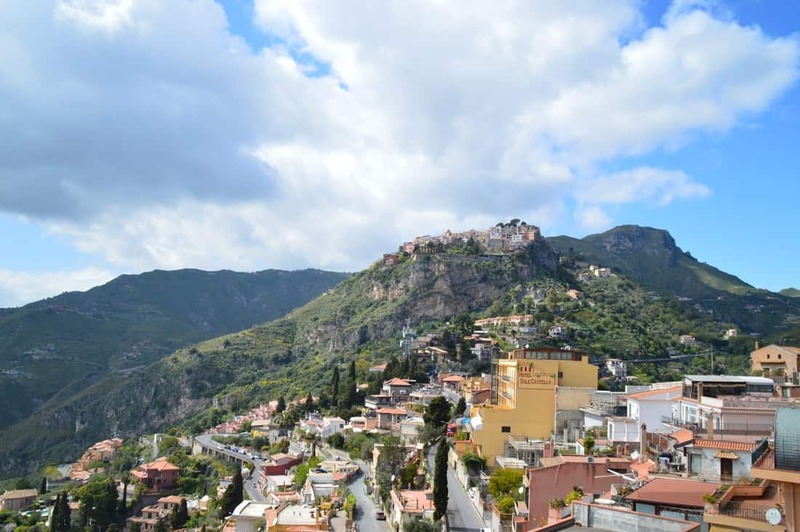 It exists in the most prominent spot of Taormina, with unparalleled view to the Calabrian coast, the Ionian coast of Sicily, along with the spectacular cone of Etna. The most well preserved part is its scene. The seats are carved into the rock. 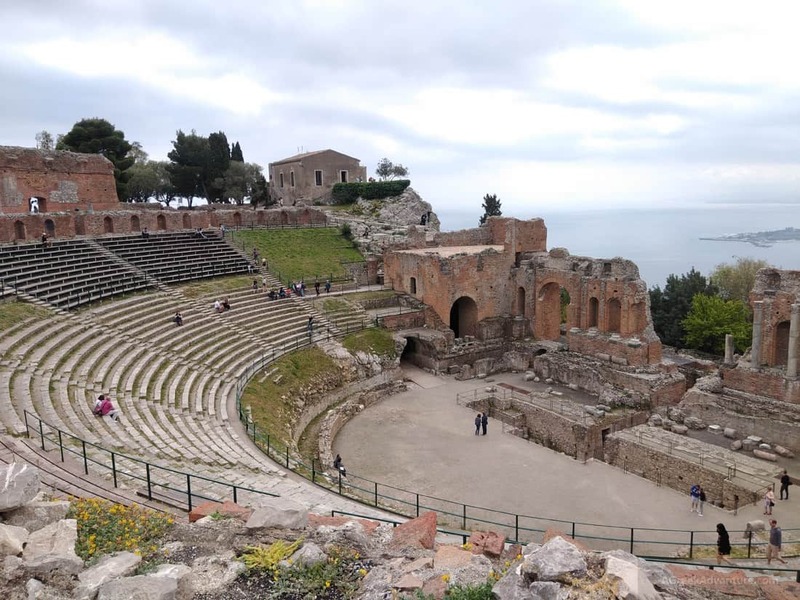 The Greek Theatre of Taormina is ranked as the 2nd largest theater of Sicily. The first one is in Syracuse. For the last 60 years, the theater hosts a wide range of theater, concert and award ceremonies, along with operas and ballets. Here is a video on how it looks. 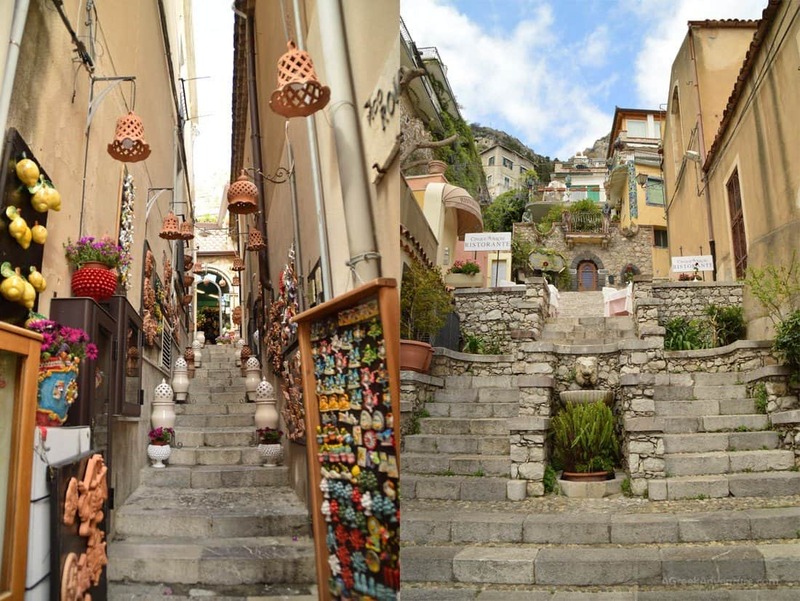 We suggest that you visit the theater first, leaving plenty of time to explore the wherabouts of Taormina city. Here is a quick view from above. Taormina is one of the most popular summer destinations. Sicily has quite a rocky coastline but in Taormina you will see a sandy beach. Loving a Sicilian “dolce vita”? Then this is one of the places. The name comes from the Greek word “Tavromenion”, which relates to bull horns. 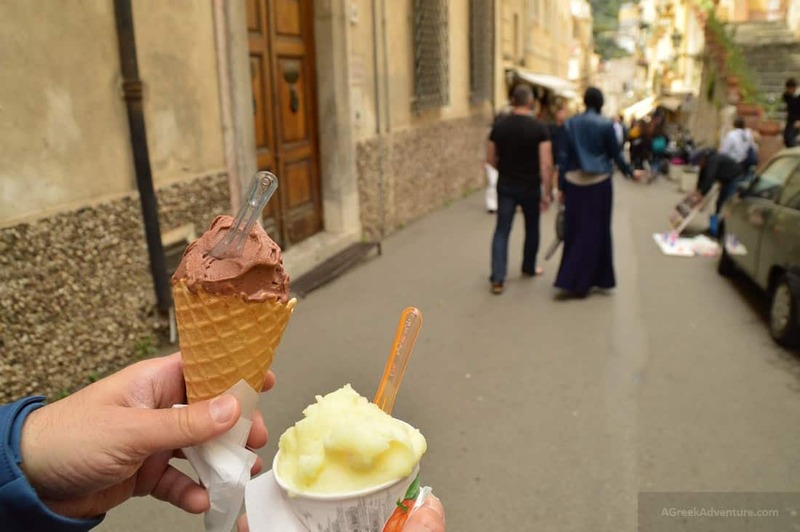 Before your walk or to cool down, grab some gellato or granita. See how beautiful it is from all different angles. To get this picture you need to climb to the very top of Castello Saraceno. You can go by car but we suggest to take the stairs. They are a few but the view climbing up is rewarding. It is unknown when the castle was build. Most probably it was the antique acropolis of the Greek town of Taormina. This below is the Duomo (Cathedral) of Taormina. It looks more like a fortress than a religious building. Notice the large rose window at the facade. 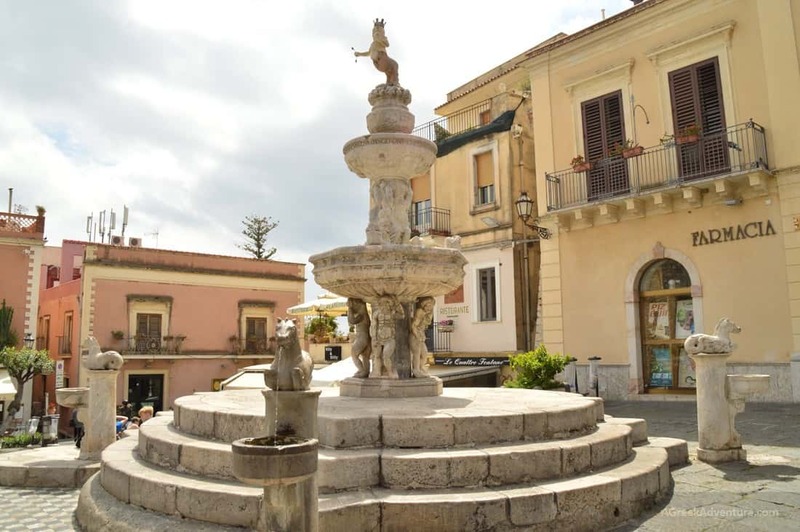 The fountain in Piazza Duomo in Taormina. It is also located in Piazza Duomo. It was built in 1635 in the Baroque style. Statues of mythological ponies face opposite from the fountain. There is a Minotaur at the top of the 2 central basins. The Minotaur is the emblem of the city of Taormina, and is in a female version. 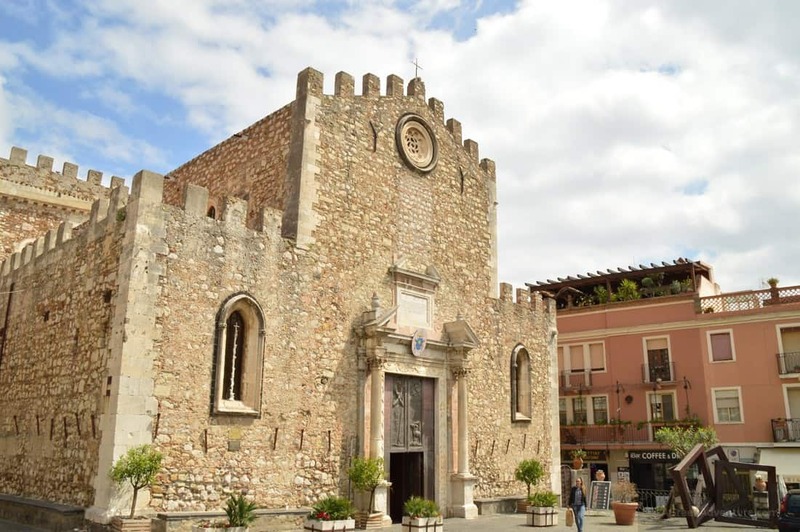 The church of San Giuseppe in Taormina (below). This church was built in in the Baroque style. It is dedicated to St. Joseph and you will find it next to the Clock Tower. The church faces onto Piazza IX Aprile. Part of the beach! It was a bit cloudy that day but when the sun came out, the waters near the beach were brightly… white! Isn’t it a beautiful city? Look here. Perhaps that is the reason it is also preferred from bon-viveurs like D.H. Lawrence, Oscar Wilde, Goethe, Alexandre Dumas, Tsar Nicholas II, Elizabeth Taylor and Greta Garbo to name a few. 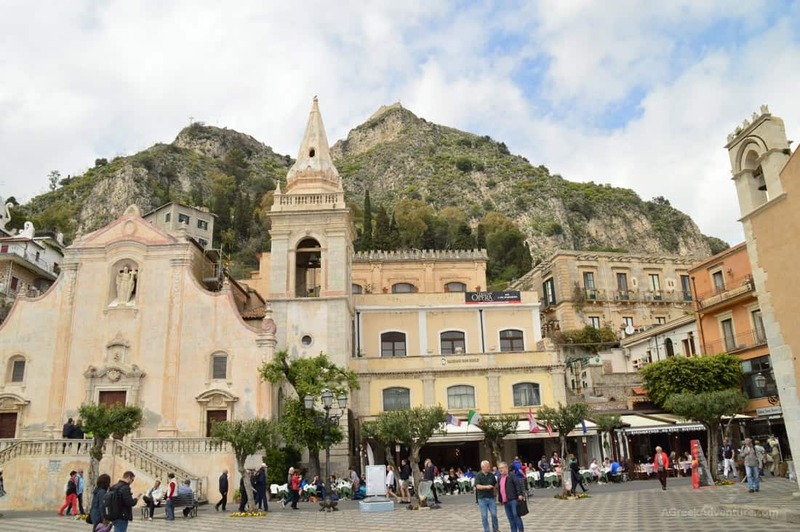 Taormina gets extremely busy in July and August and virtually “shuts down” between November and Easter. However, we went during Easter time and there were lots of crowds from all over the world. 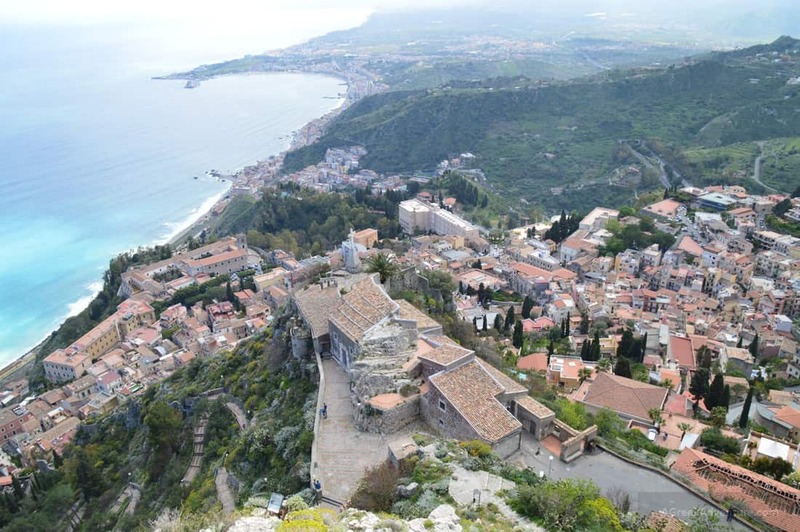 We hope you visit Taormina and like it as we did.